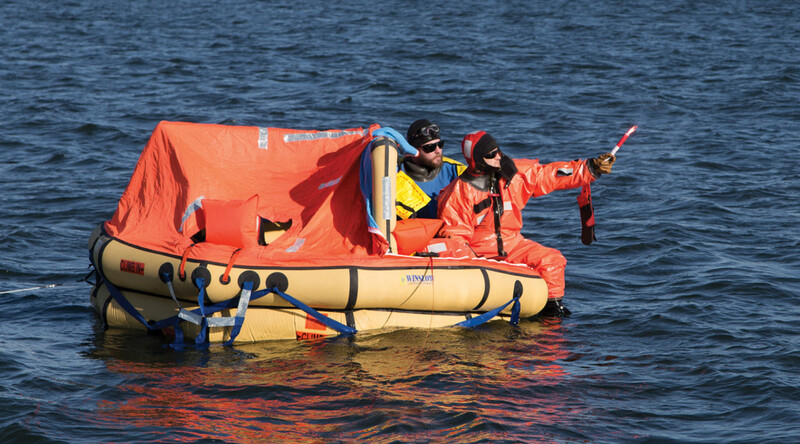 We take a chilling plunge with survival experts to learn just what to do in a boating emergency. The first time I got in a boat I fell out of it. I was 4, which was old enough to understand the fear. I can still remember the moments leading up to the incident. The jolt of excitement for my first boat ride. Leaning lackadaisically over the bow of the small skiff my father had rented for the day in Martha’s Vineyard. A classic New England overcast sky. My hand trailing in the water. And then, all too fast, the gut-wrenching feeling that comes from leaning too far over, unable to correct, followed by cold water and the whoosh of the prop by my head. 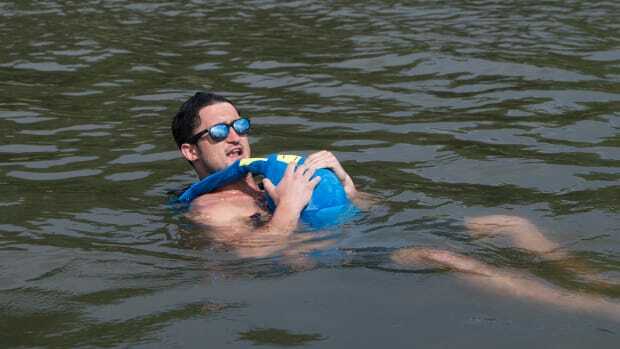 That day, my life was saved by a flotation vest and my father, who, with an armful of adrenaline, scooped me up out of the water and tossed me back aboard. 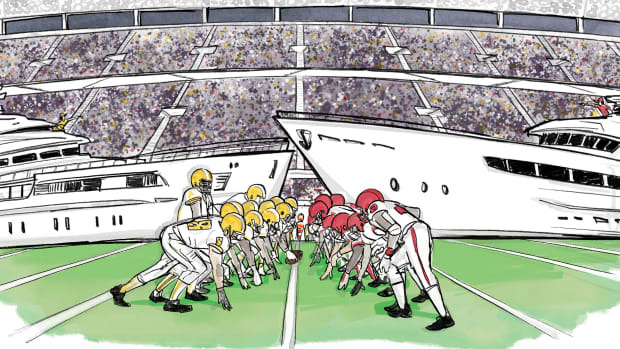 When we think about at-sea emergencies we imagine extraordinary circumstances—like a capsized boat in storm-tossed seas—but the truth is most accidents happen near shore, in calm waters, often with only ourselves to blame. According to recreational boating statistics compiled by the Coast Guard, of the 5,967 reported vessels involved in fatal accidents in 2016, over half of them (3,751) were involved in an activity defined as “relaxation.” And the majority of these fatalities occurred during the day in conditions that were considered calm (waves less than 6 inches), with good visibility. My guess is these tragedies occur because many crews just don’t know what to do in an emergency. I wanted to get educated, so with that goal in mind I made plans to take another plunge. This time a deliberate one. 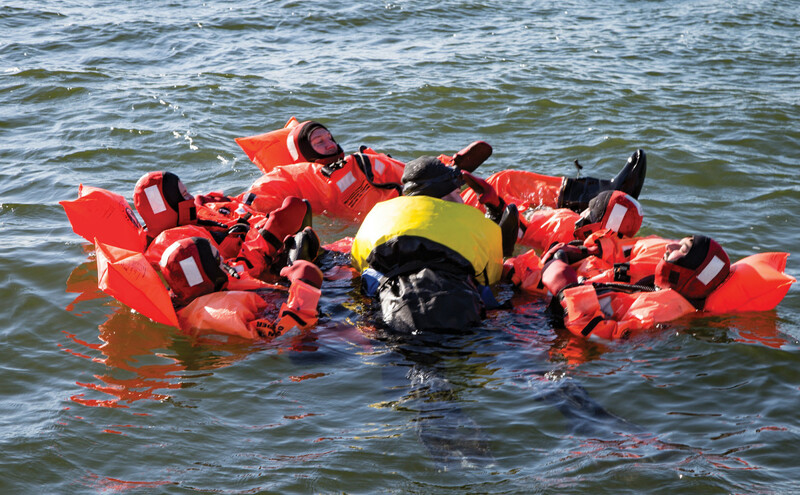 Along with my colleagues, I enrolled in a sea survival course at Survival Systems USA in Groton, Connecticut. 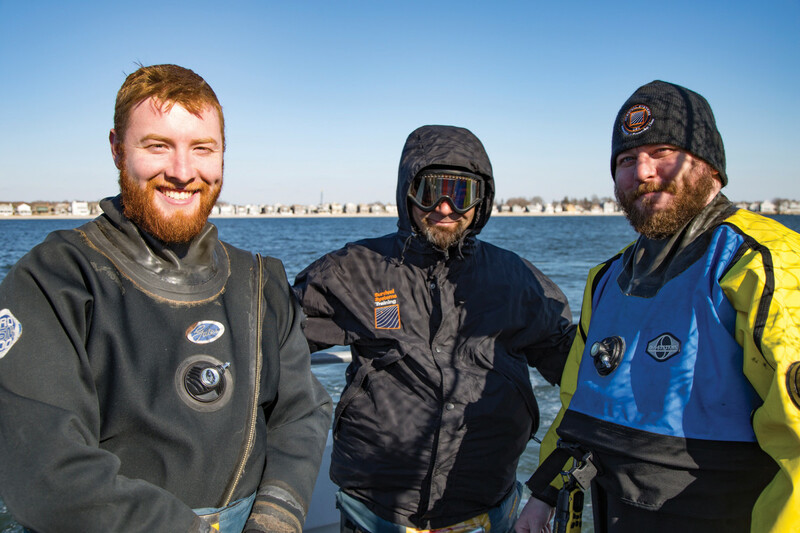 We were told early on that the final exam would be no ordinary pen and paper test, but rather full immersion in 36-degree water on a cold February day in Long Island Sound. A simulated Coast Guard basket rescue at the facility’s impressive pool would be thrown into the mix as well. In this class there were only two options: pass or fail. Sink or swim. Even though it was freezing outside, the instructor told us we would be sweating in our survival suits. Across from the Groton-New London Airport in southeastern Connecticut is a nondescript, two-tone building. If you don’t know what you are looking for, you could easily miss it, or just assume it’s a storage facility or part of the airport’s infrastructure. The only giveaway that this is a survival training facility is the shell of a Mercedes-Benz Sprinter van—its windows and doors blown out—sitting upside down on an elevated platform, looking altogether destined for the scrapyard. The van is unusual, even by Survival Systems USA’s standards. It was used as a life-size prop while filming a car crash for the Netflix original series, The OA. In the scene, a van carrying school children careens off a bridge into a river. To simulate the impact and the daring underwater escape, the show’s creators made use of Survival Systems’ 13-foot-deep pool—what they call the “dunk tank”—that typically sees all manner of replicated aircraft and helicopter crash scenarios. The pool is one reason commercial and private aviation professionals, rescue operators, federal and state law enforcement and even the United States military come here to learn how to survive a life-threatening crash. When we arrived, we were greeted by our instructor, Steffan “Uzi” Uzzell. A former Navy corpsman, Uzzell would lead us through a variation of the organization’s survival course; his mission was to teach us how to survive while stranded in the open water with limited resources for an unknown period of time. 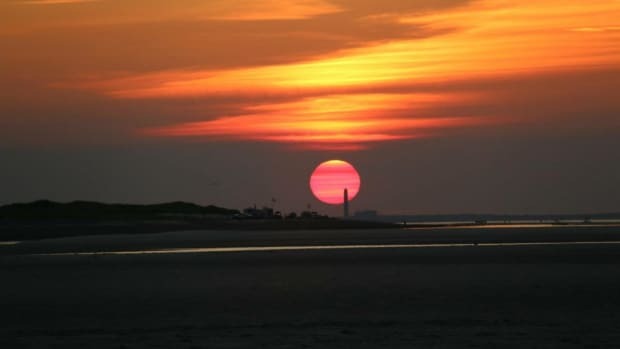 “The time to start figuring out how to pop a flare off is not two in the morning with a helicopter flying overhead,” said Uzzell. After a quick tour of the facility, we were led to a classroom, where we would hunker down for the next three hours. That seemed like a long time to be confined to a classroom, and Survival Systems acknowledged the course was designed with aircraft pilots in mind. Yet they assured us there were numerous takeaways here for boaters. It turns out there were a shocking number of things I didn’t know. 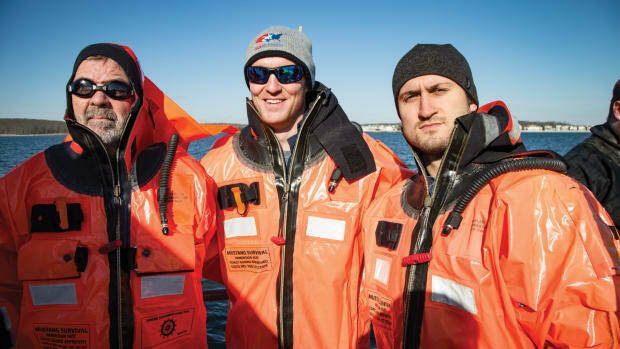 I don’t go boating in the Arctic Circle or Antarctica, so I assumed I didn’t have to worry about hypothermia or cold-water immersion. Wrong. Many of us equate water temperature with air temperature, which is a fallacy. Water is a great thermal conductor, which means that heat is taken from the body much faster in water than it is on land—or about 25 times faster. When water is in the 50- to 60-degree range, the human body is susceptible to cold shock response, which is characterized by loss of breathing control, a spike in heart rate and blood pressure and mental incapacitation. As anyone that’s taken a polar bear plunge can attest, cold shock can be exhilarating, but also debilitating. (And for people with a family history of stroke, aneurysm, high blood pressure, hypertension or sudden cardiac death, it can be downright deadly.) That’s because the outer blood vessels constrict to try to retain heat, shifting an inordinate amount of blood to the inner organs to keep them warm. On the ride over, Uzzell ticked off a list of organizations that have been trained by Survival Systems. They include NOAA, foreign militaries, the FBI, CIA, U.S. Special Forces and, with this course in particular, the Sea Scouts. We had no excuse left. It was time to get wet. 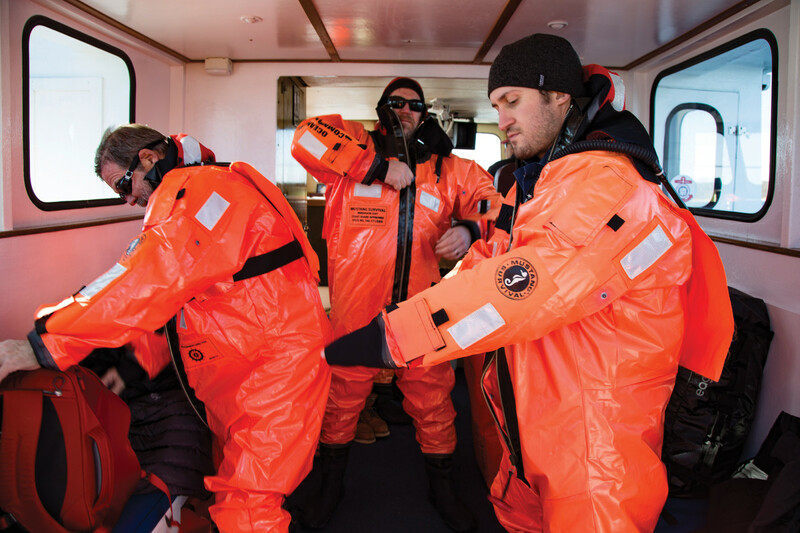 On the boat, as I pulled on my survival suit, my mind wandered back to the classroom. It was there Uzzell had told us that the average person wearing regular clothes and a proper life preserver can survive about two hours in 50-degree water. As the water temperature decreases, so too does your survival time. Fortunately, there were spotters on board who were ready to jump in at a moment’s notice if one of us got in trouble. In addition, Uzzell, who was wearing a dry suit, would accompany us. What could go wrong? 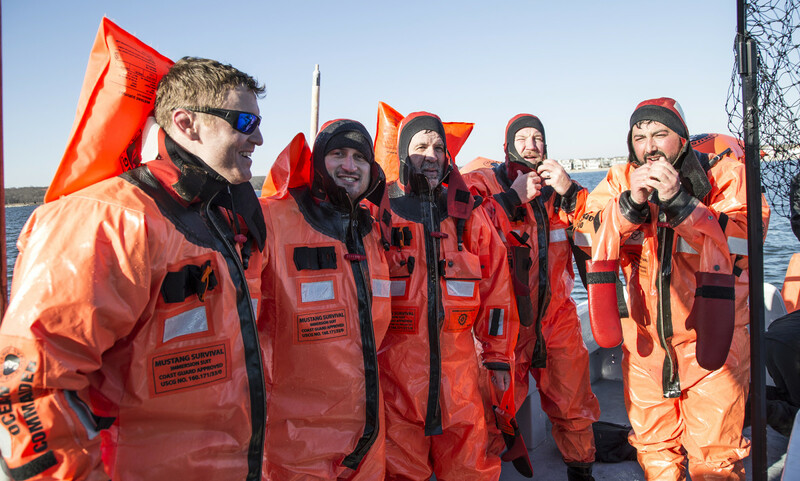 I tried to imagine a scenario where there were no spotters, survival suits or instructors—if, let’s say, I was operating the boat alone and fell into this wintry sea. We were four miles from land and I could see houses along the shoreline. And yet, without a survival suit, in the event of an abandon ship scenario or MOB, I would most likely succumb to hypothermia before swimming a mile. It was a sobering thought. One after another we jumped off the open transom into the 36-­degree water. Once immersed, we came together to practice survival techniques. Those included the carpet formation, which involves leaning back and cradling the leg of the person across from you and vice versa, thereby joining as a group to float together, share body heat and scan for rescue. And because the formation enhances buoyancy, it can also support two “injured” survivors, who could lie across our outstretched legs. Once you’re in the water, said Uzzell, never separate from other survivors. 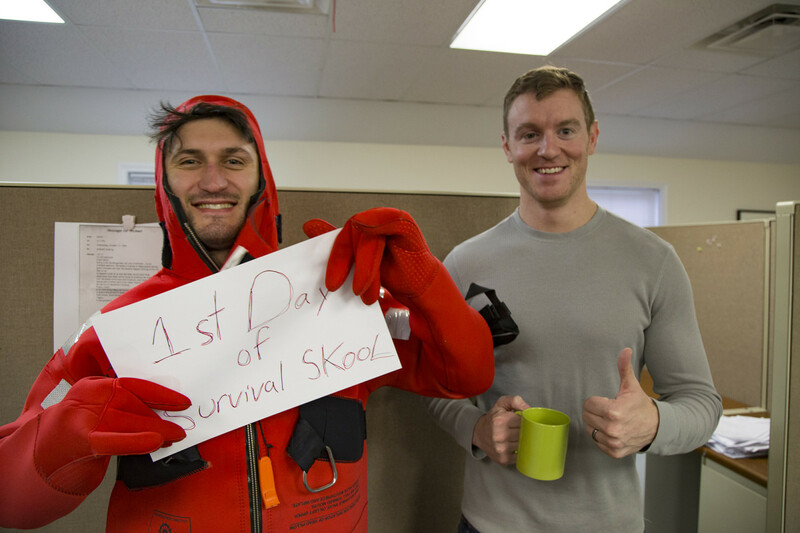 Managing Editor Simon Murray and Editor-in-Chief Dan Harding having some fun in the office before taking the plunge. Next, a liferaft was tossed from the boat, which was about 50 feet away. How would we reach it together? Using lessons from the classroom, we formed a chain. Each person locked their legs around the person in front of him and held the legs of the person behind him, like a slapdash rowing team without the racing shell. Then together, we rowed in unison with our arms, with the person at the head of the chain acting as the cockswain, calling strokes in a measured cadence while the caboose focused on kicking their feet. 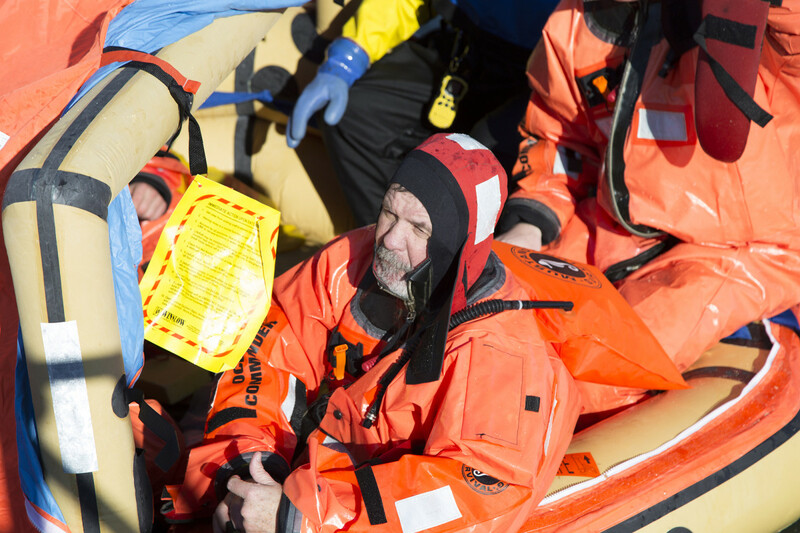 Once we made contact with the liferaft, Murphy’s Law struck. The hypothetical hole in a dry suit Uzzell had mentioned earlier had materialized—in his own suit—and caused a leak. As a result, he was losing feeling in both of his legs. Suddenly, deploying the liferaft was a high priority for our group. But then another problem emerged: The raft would only partially inflate. So, we used the ditch kit’s collapsible buckets to bail seawater. 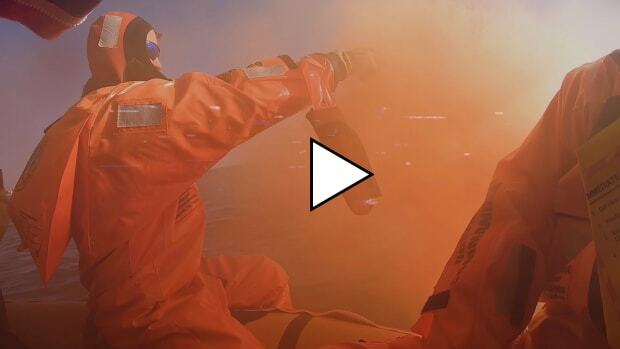 After everyone had climbed in the raft, Dan Harding, Power & ­Motoryacht’s editor-in-chief, was instructed to light an orange distress flare. As he did, the wind turned, creating a wind tunnel that sucked the Cheetos-colored cloud back into our temporary rubber abode. To make matters worse, luck had dealt me a terrible hand: I had been one of the first to climb in, which meant I was currently occupying the inside corner of a partially inflated, partially covered raft. I tried to remain composed, praying I didn’t get seasick while breathing in the sulfuric fumes. Throughout this drill, Uzzell preached the importance of morale for survival. I had largely paid it little mind, but now, from where I was sitting, I could see how important morale could be. “Your best friend, your coworker—all of a sudden you see them having what you do not have, and you start wanting that,” he said. As I watched Dan and the others hang their heads over the side of the raft to escape the flare’s rotten egg-like smell, I could sympathize. And yet Murphy wasn’t done with us. 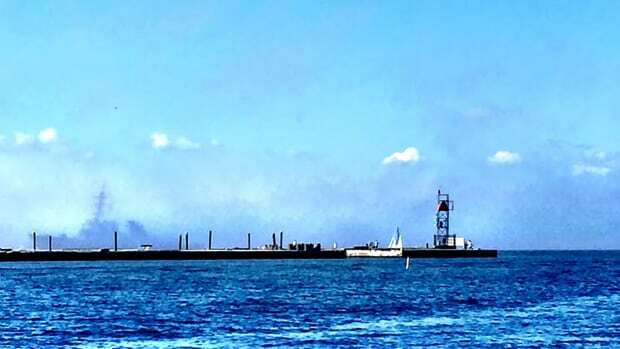 Next, a rocket flare held by Editorial Director Bill Sisson refused to ignite, and the magnesium burn flare promptly fizzled out when placed underwater. But fortunately by this time we had been “rescued.” The local National Guard base, alerted beforehand about our survival course, had sent over a helicopter to investigate. And not a moment too soon. 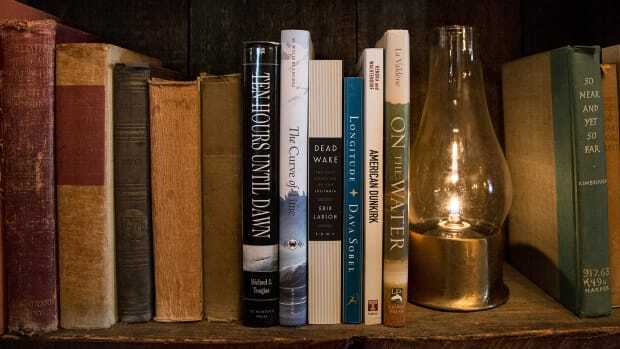 We had started to dig into the rations, under the pretense that we would try them for propriety’s sake. They had the distinct taste of peanut butter mixed with wood chips. All told, we had been in the water for less than an hour. I had expected the thunder, the lightning and even the freezing rain, but not the gun shots. But then again, after the cold-water portion of the course, I should have been ready for anything. We had survived the Sound, but we still had to finish the day back at the Survival Systems facility. There, in the dunk tank, we each took turns being lifted 15 feet into the air by a Coast Guard rescue basket suspended from a crane, as the instructors hit us with all the environmentals the simulator could muster, including loud bursts of enemy fire. After the Sound, the dunk tank was a merciful 82 degrees. Here we could practice being rescued in water that felt more like the stuff we swim in around Florida or the Carribbean, which was perfectly fine with me. We had been instructed to let the rescue basket hit the water first before touching it, so as to allow the static shock generated by the helicopter’s propellers to dissipate. (The built-up static electricity can travel down the metal basket and incapacitate an adult.) 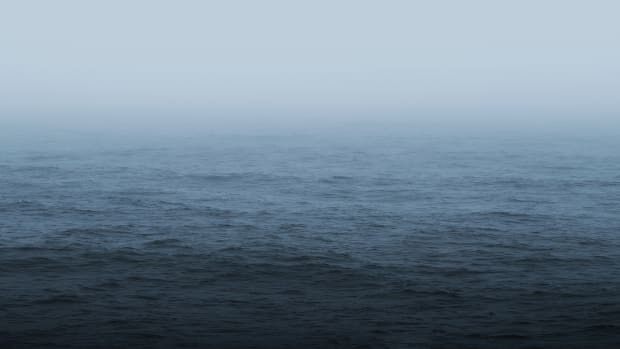 As I was being lifted into the air, cold rain pelting my body, it was easy to imagine the real thing: a cruise gone wrong, adrift at sea, surviving until help arrived. Ironically, the sea survival course, with its unintended misfires and hiccups along the way, had cemented in my mind the importance of this type of education. Even professionals are at the mercy of malfunctioning gear, and the best-laid plans can backfire. The only solution seems to be education and training, redundancies and practice. True, it’s tough to know when—if ever—these lessons will come in handy. Hopefully never. But if they do, it’s always better to be prepared for the worst, because every now and then, regardless of our age, we all get dealt a bad hand. Tip: An average-sized person wearing regular clothes and a life preserver in 50-degree water can survive for about two hours. As the temperature of the water decreases, survival time is drastically reduced to 30 minutes or less. Tip: A signaling mirror is great to have in a ditch kit, but if you go overboard and don’t have a mirror handy, you can use your cell phone’s glass as a makeshift signal. Don’t have your cell phone? People have even been rescued using the reflective logo from their credit card. 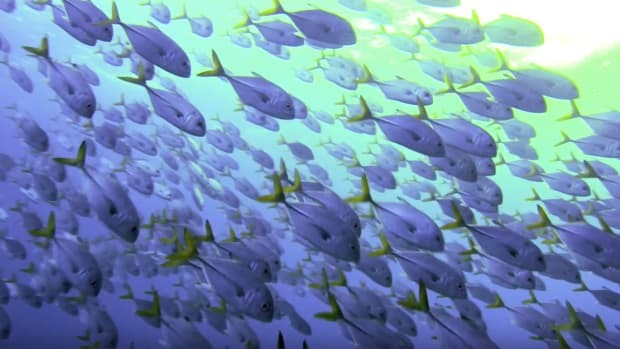 Tip: Deeper voices are harder to hear in the open ocean; lower decibels are more easily drowned out by wind and waves. Higher-pitched female voices are easier to hear above the noise. Tip: If you don’t have a 55-gallon trash bag in your ditch bag, you should consider adding one. (It’s light and compact, so it won’t take up space.) Trash bags are good as a poor man’s wetsuit, and add a layer of protection against hypothermia in the open water. They’re also good for long-term survival—think water collection and building a shelter. Tip: Desquamation (from the Latin desquamare, meaning “to scrape the scales off a fish”) occurs in humans after skin has been submerged in salt water for a prolonged period of time. If suffering from this condition, avoid skin-on-skin contact, as this can rip the outermost layer off. 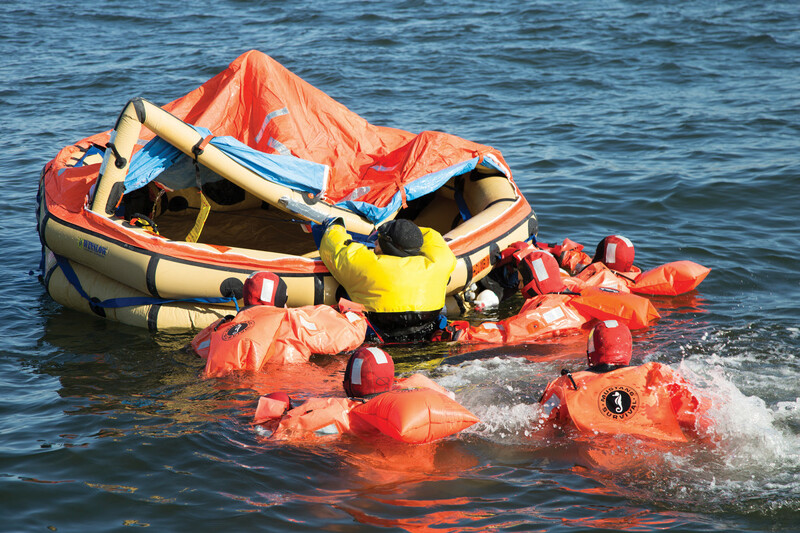 Tip: Every liferaft has an overflow capacity of 50 percent. 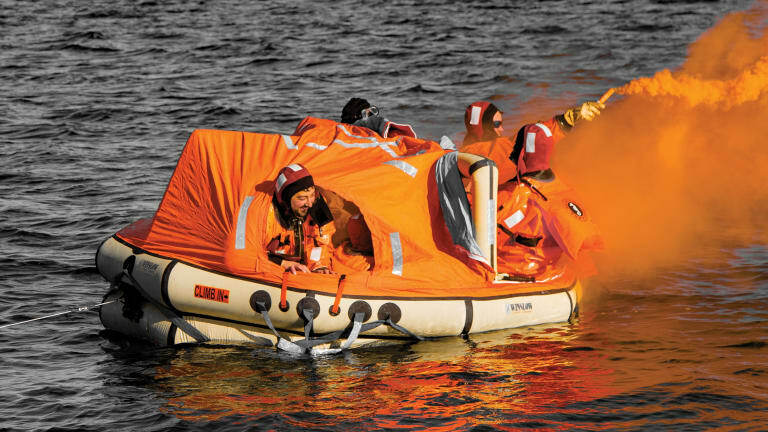 So, a 12-person liferaft can technically hold 18 people in a pinch. Tip: Don’t believe what you see in movies: Tourniquets aren’t nearly as effective just two inches above the wound. Instead, place one higher up on the leg or arm, where arteries or veins can be compressed against the bone. Tip: When adrenaline and shock wears off, you’re going to be hungry. Resist the urge to start breaking into your rations immediately. And if you don’t have clean water, don’t eat. Food, especially survival rations, can dehydrate you. The human body can go three weeks without consuming food; it can only go about three days without imbibing water. Tip: Cold shock response can be triggered in water as warm as 60 degrees, and lasts between one to three minutes based on your level of fitness, age and body type. Get into a life­raft as soon as possible.